I love picots, and was thrilled to learn the picot bind off a couple of years ago. And even more thrilled when I learned the picot cast on. Imagine my surprise when I discovered I could add picots to the sides as well, to create a picot border! It's the small things in life, isn't it? The method of adding picots to the sides is the same idea as the cast on or bind off - you simply cast on a few extra stitches and then immediately bind them off. Easy peasy lemon squeezy! 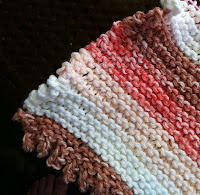 I have knit a dish cloth or wash cloth with a lovely picot border and am sharing the pattern. Below is also a video on making the side picots. If you don't know how to do the cast on or bind off, I have videos for those as well over on my YouTube channel. 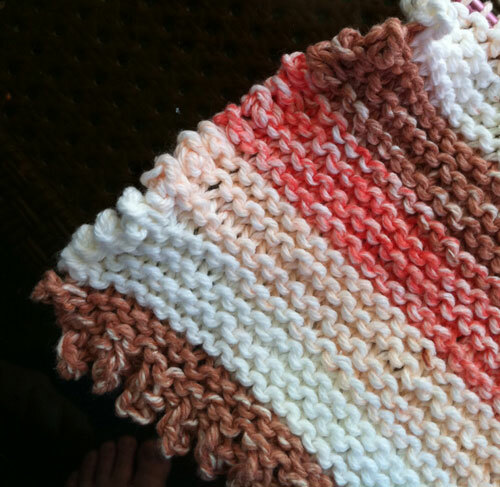 All you need is some Lily Sugar'n Cream cotton yarn, and US size 7 needles. Cast on 46 stitches using the picot cast on method. Repeat Row 2 to desired length - I just knit until I was almost out of yarn. Then bind off using the picot bind off method.